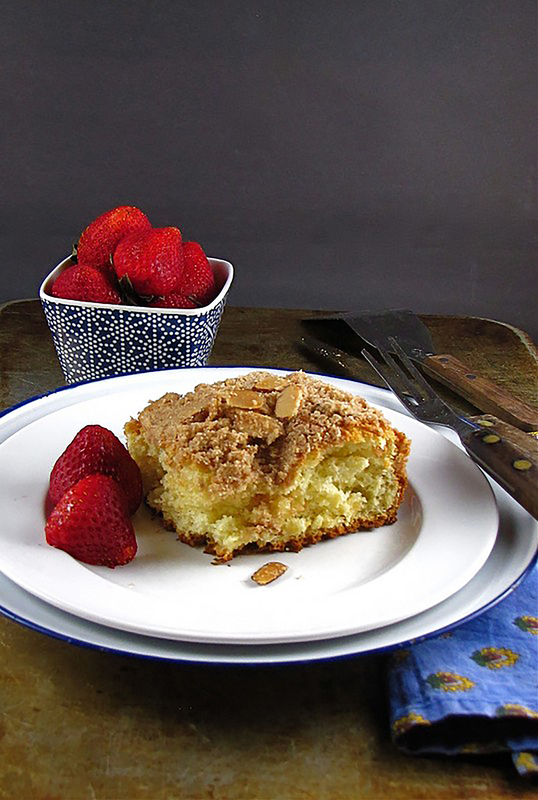 A delicious coffee cake with the streusel topping reveled throughout. In large mixer bowl, combine 1½ cups flour, yeast, sugar and salt; mix well. In saucepan or microwave-safe dish, heat water, milk and butter to 120-130°F (butter does not need to melt). Add to flour mixture. Add eggs. Blend at low speed until moistened; beat 3 minutes at medium speed. By hand, gradually stir in remaining flour to make a stiff batter. Spread in a greased 13x9-inch pan. Prepare Topping: Combine all ingredients; mix well. Sprinkle topping over batter. With back of a spoon, make random indentations in dough. Cover; let rise in warm place until doubled, about 30 minutes. Bake at 375°F for 25 to 30 minutes until golden brown. Serve warm or cold. I added almond paste to the top of the dough it adds sweetness and then add the toppings. Comes out really good. I made this yesterday and it was good, but bland. I added more sugar and cinnamon after tasting the blandness and that helped some. I think it needs drizzled butter or frosting…something moistening…and it would add more depth to the flavor. It is just missing something.